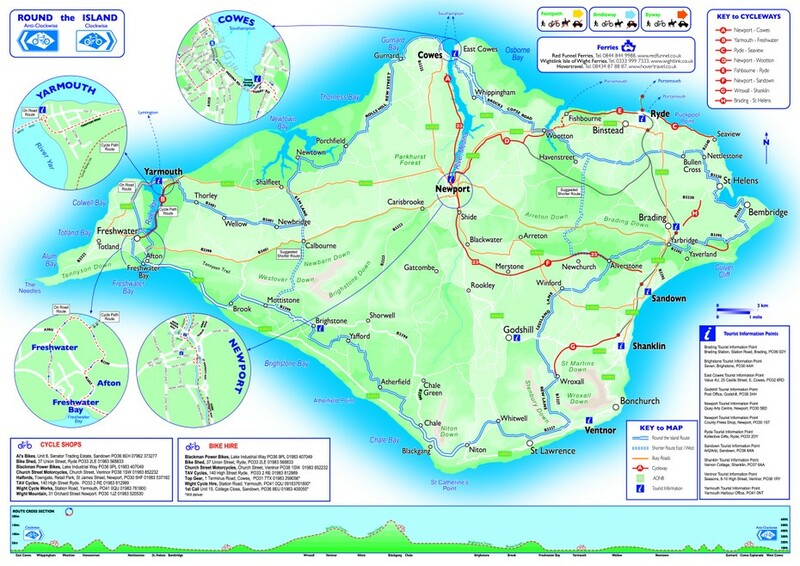 The most exciting development of recent years on ‘The Island’ (as caulkheads call it to all of you overners) is the opening of part of Route 23 of the National Cycling Network which covers the 16 miles from Cowes to Sandown. Built for the most part on disused railway track bed it is flat and traffic free apart from when it traverses Newport, the county town. The views give you a terrific feel for the wide range of landscapes which exist here as well the quiet and tranquillity, though do be warned that apart from the aforementioned Newport there is nowhere along the way to stop for a cuppa. At the time of writing the signing at both ends of the route needs improving but once on the track just relax. And of course once you arrive at Sandown or Cowes you can always go for a swim and an ice cream. There are other flat traffic free cycle routes as well, the best for many, being from Yarmouth to Freshwater. This provides lovely views across the Yarmouth estuary and gives bird watchers great opportunities. Along the route are benches to sit down and enjoy the views. At both ends of the track there are things to do; Freshwater Bay has a beach for a swim or a leisurely climb up on to the Downs and Yarmouth is a picture post card type of a place where you can do a holiday type mooch about and look at the comings and goings in the harbour. For the more ambitious a round the island route exists. This is 100 km long and is sign posted by a unique set of signs which are different patterns depending on whether your are travelling clock wise or anti clock wise. The route is on a variety of roads but as far as possible takes you away from the more busy roads. This, if done in a day, which many do, is a challenging ride as there are several steep climbs. There is much accommodation along the route as well as things to see so it is quite possible to plan your journey with over night stops. Alternatively distances are relatively short so you could just return to where you are staying. Some of the places which are on the route are Osborne House home of Queen Victoria, Blackgang Chine a theme park and Cowes where there is always some kind of action on the sea as well as a wealth of places to eat though do not expect to be able to pop into the Royal Yacht Squadron for a cup of tea and a piece of cake. The highlight for many is the view from the top of Blackgang looking along the south coast of the Island while one eats a well deserved ice cream. Off road routes are plenty. The local council is rightly proud of the high level of Rights of Ways and so there are many bridle paths which cyclists can take advantage of as they pass through woodland, over downs or spin gently along in picturesque country side. Parkhurst Forest, near Newport, provides a gentle ride and allows you to look for red squirrels which are present in most woods on the Island. For the more hardy there are the old sheep droves, such as the Tennyson Trail, which criss cross the landscape, many being on the ridges of the downs. The views from the top are spectacular, on a clear day from the downs at Brading or Brighstone it is possible to see both sides of the Island to the coast and the other island just across the narrow strip of the Solent. Some of the climbs can be hard and technical but if you do not possess the stamina or bike you can always push your bike and just enjoy the vistas. And there is always the coming down. Many of these areas are AONB’s once described as Britain’s equivalent of a tropical rain forest. If you literally do move off the beaten track you can understand this as there a myriad of wild flowers and plants, many very small, but worth the effort of just stopping to have a look. The tops of the downs are also great places to have a rest for a picnic and spend time looking at the wildlife and the places down below; so a pair of binoculars are always useful as well as a spare inner tube! For city dwellers there is only one Halfords and it is not on top of the downs. As well as the advice above it is easy to make up your own route and itinerary. There is a wide range of material available on the web or books, written by locals which are available in various shops. In such a short space it is difficult to convey all the information about this unique location. Do come and sample its many delights. See if you can find the thatched church, the place where Britain’s rocket test site was and of course the burial place of the last man killed in a duel.